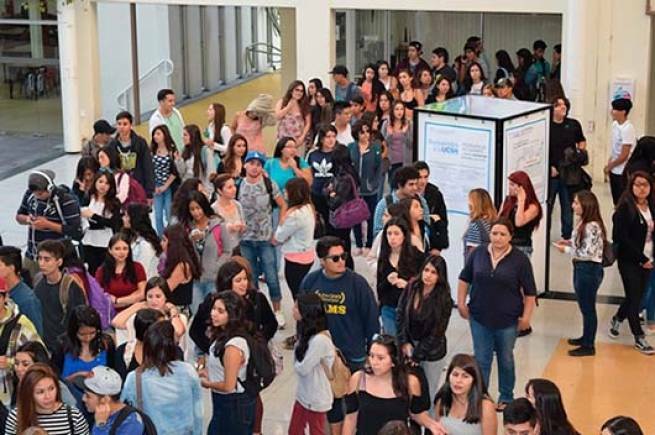 (MissionNewsire) This year, 1,690 new first year students were welcomed at the Salesian-run Silva Henriquez Catholic University located in Santiago, Chile’s capital and largest city. Nearly 64 percent of these students (1,106) were admitted to the university free of charge. Salesian missionaries living and working in the region offer the free university education to students who are unable to afford university education. The goal is to encourage higher learning, help students gain the education needed for a career, and encourage graduates to contribute back to their communities. The university was named after Archbishop Raúl Silva Henríquez, who served from 1961-1983, during a period of intense political struggle in the country and culminated in the 1973 right-wing military coup that brought General Augusto Pinochet to power. Archbishop Henríquez was a member of the Salesian religious order dedicated primarily to missionary and educational work. Salesian schools, services and programs throughout Chile are helping to break the cycle of poverty while giving many hope for a more positive and productive future. According to the World Bank, although the economy in Chile is one of the more stable and prosperous in Latin America, a little more than 5 percent of the population live on just $2 a day. The country suffers from high economic inequality which is particularly evident in access to educational opportunities. Salesian technical schools in Chile cater to students who have dropped out of school and are seeking a second chance. In many programs, students complete their education while engaging in internships with local employers increasing their hands-on work experience and chance of gaining livable wage employment after their studies are completed.